Old Friends, the Thoroughbred Retirement facility in Georgetown, KY., today announced the arrival of New York-bred multiple stakes winner and multiple graded stakes-placed runner Kharafa. 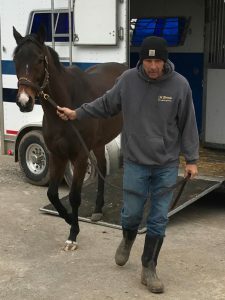 He completes the triumvirate of New York-bred turf stars at the farm, joining Lubash and King Kreesa, whose storied rivalry thrilled their fans in New York and beyond over the years. Trained by Timothy Hill for owners Paul Braverman and Timothy Pinch, New York-bred warrior Kharafa finished out his career after 52 starts in eight seasons. A star of the NYRA circuit, Kharafa captured multiple runnings of the Ashley T. Cole Stakes and the Kingston Stakes at Belmont Park as well as Aqueduct’s Three Coins Up Stakes. This August the 9-year-old was the unexpected star of Saratoga’s New York Showcase Day after capturing the $150,000 West Point Stakes to the delight of his fans. The win brought Kharafa’s career earnings to $1,238, 622.